Okay, so the lameness is finally finished. I started working on this tonight with some coffee and a little motivation...well, it's done finally. For the record, I wanted to get rid of this entire sequence involving the "terrorists" from the story, but laziness got the better of me. I drew this nearly 6 months ago and just wanted to get it over with. The gross terrorist stereotype bothers me, the term is far too overused nowadays.. I tend to believe that the our wonderful GW Bush is the most destructive "terrorist" or at least a pawn of them. 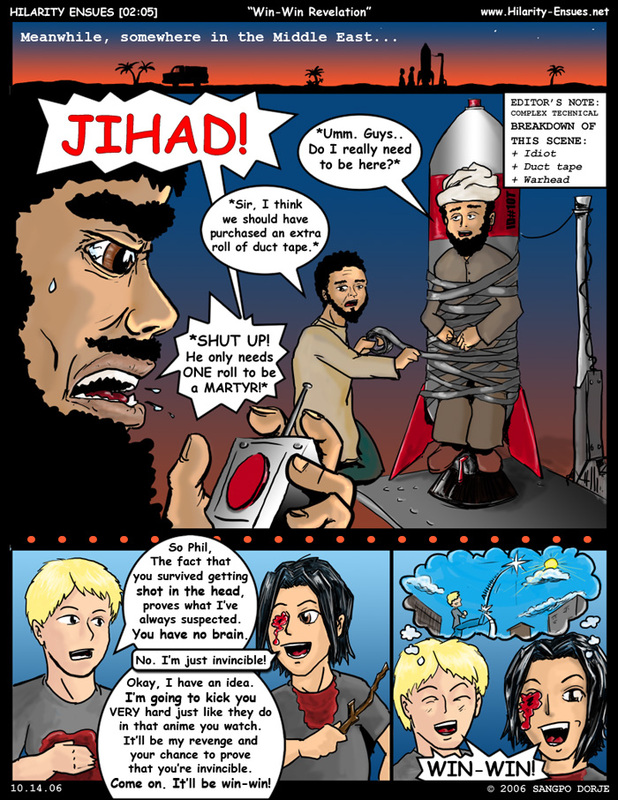 This comic is not inteded to offend, and I doubt it could, considering it's dumb ridiculous nature anyway. Best if viewed with a display resolution of 1024x768 or higher.